HOMOFY Jurassic World Flexible Race Car Track!! GO NOW!! Dinosaur world create a road toys: this dinosaur toys Jurassic world race track set toys is martial theme with military vehicles, green orbits &dinosaurs which can arrange them to enjoy Army adventure and racing fun.Watch the battery-operated race car running around the track that you created, flying around the curves, racing over the hilltop, rushing the tunnel, coming across the dinosaurs.Imagine, what an exciting adventure it will make to your kid. Various accessories: this 192 pieces dinosaur toys for 2 3 4 year olds race racks and accessories includes Army green tracks, 2 military off-road vehicle, 3 dinosaurs, 1 trees, 1 tunnel, 2 tunnel Accessories2 tunnel accessories use for bridge).various accessories make the track more fun.Kids can flex in different shapes & layout with their mind. Endless possibilities: track sets in 3 colors flexible track dinosaur toys assembly easy to be turned, flexed to form different track shapes, moved and reshaped, to build limitless track configurations.The military car run around the tracks and kids will enjoy racing fun with this amazing toys! 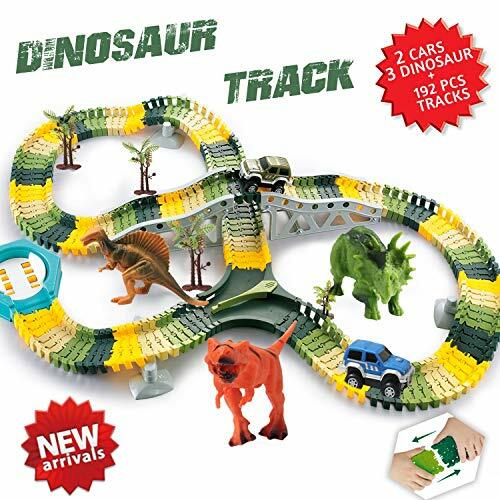 Enjoy the Prehistoric world: turn on the military vehicles（colorful light) and see it go around the tracks, through slop and watch dinosaur toys world in the park.This car track set pretends to bring kids to Jurassic world with realistic dinosaurs. Make an amazing gift or birthday present to your kids! !